If you have ever seen this odd looking, alien-like vegetable in your produce aisle, you may have wondered what it is and how on earth do you eat it. Well it’s called romanesco, often referred to as Roman Broccoli or Roman Cauliflower, and it’s a variant form of cauliflower. I just recently I received two heads of it in my CSA package, and I was extremely eager to try it out! Romanesco is a great diversity for fans of the cauliflower who ran out of ideas on the different ways of preparing it. 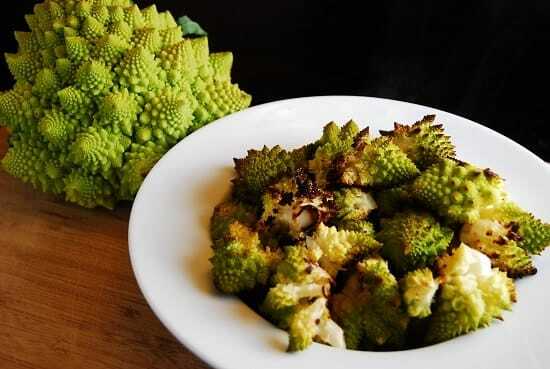 Romanesco may be prepared similarly as the cauliflower, but it is more easily digested. And are you ready to hear what nutrients you are getting in this beautifully strange vegetable? It’s loaded with: Vitamin B1, Thiamin, Vitamin B2, Riboflavin, Vitamin B3, Niacin, Vitamin B5, Pantothenic Acid, Vitamin B6, Pyridoxine, Vitamin B9, Folate, Vitamin C, Vitamin K, Dietary Fiber, Manganese, Magnesium, Protein, Phosphorus, Potassium, Tryptophan, and Omega 3 Fatty Acids — impressive! To get the full appreciation for the flavor of the vegetable, I decided to do a simple roasting of it. I broke it down into florets, lightly misted it with my olive oil mister, sprinkled some sea salt on top and popped it in the oven. It was absolutely delicious. It tastes like a combination of cauliflower and broccoli. I admit that the shape of this vegetable is a little off-putting, but don’t let that scare you away! It’s so delicious and so easy to prepare and makes a wonderful 0 Points side dish. Plus, it will make one heck of a conversation piece at the dinner table. Give it a try! An unconventional, yet tasty vegetable, romanesco gets a simple roast in this easy, low calorie side dish. Preheat oven to 425. Line a baking sheet with aluminum foil and then spray with non-fat cooking spray. Break romanesco down into florets and spread out evenly on the baking sheet. Lightly mist the romanesco with an olive oil mister, and then sprinkle with salt. Roast for about 20 minutes, or until romanesco is tender.